These are two kayaks and a canoe. The painting came from a recent fishing trip down part of the Caney Fork river with several friends. This river is a really good trout stream. This day wasn't tremendous for fishing for us, but the weather was perfect and it was a good trip. 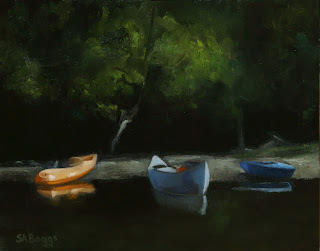 We had stopped for a break on a gravel bank for a few minutes and the composition for this painting came from our colorful boats on the bank. I hope that you enjoy the painting.